The Premier Motor Company of Indianapolis, Indiana in 1905 built a special race car to compete in the 1905 American Elimination Trial and Vanderbilt Cup Race. The four-cylinder car had a huge 923.4 cubic inch engine; the largest air-cooled motor in existence and some speculated that it could produce 100 horsepower. As shown in this photo submitted by Mark Dill, this Premier Vanderbilt Cup Racer is currently exhibited at the Hall of Fame Museum at the Indianapolis Motor Speedway. The Premier Vanderbilt Cup Racer was slated to be driven by track racer, promoter and entrepreneur, Carl Fisher. Premier and Fisher, who later founded the Indianapolis Motor Speedway in 1909 and developed Miami Beach and Montauk Point, were determined to compete with the Europeans. Unfortunately, the car was far and away the heaviest entry for the 1905 American Elimination Trial at over 2,500 pounds – easily 300 pounds over the allowed maximum weight. When Fisher and Premier’s chief engineer George Weidely realized their blunder, they set about lightening the car. Some 256 half-dollar size holes were drilled in the chassis, axles and other hardware. As seen in the first photo, these holes were never filled. A drive shaft with a heavy bevel-gear assembly was removed and replaced by chain drives to the wheels. 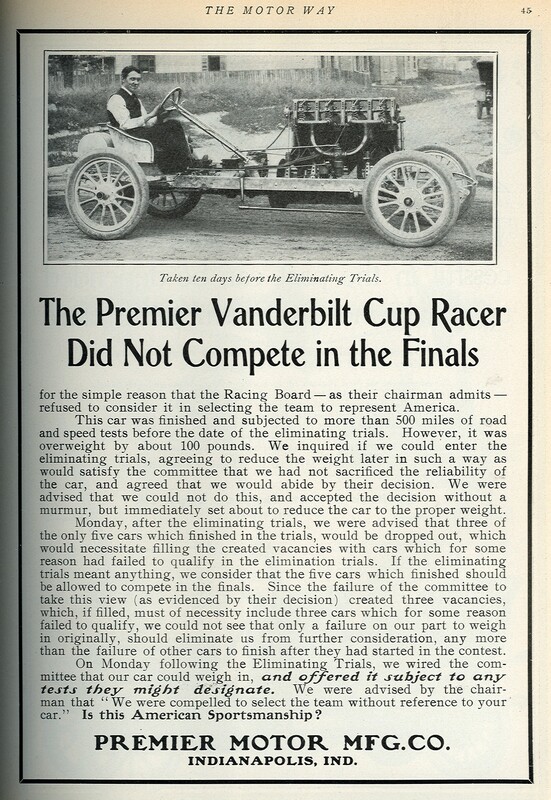 Still 80 pounds over the 2,200 pound weight requirement, Fisher and Weidely appealed to the Vanderbilt Racing Board for an exception with the understanding that they would find a way to eliminate the extra weight before the Vanderbilt Cup Race. This request was denied. Even after the five cars were selected for the American Team for the Vanderbilt Cup Race. Premier ran an ad in the automobile trade journals protesting the decision. Thanks for the photo credit. In the old B&W photo, who is the man in the car? I can tell you it is not Fisher. I have never seen a picture of Weidley. I always thought it was Carl Fisher. It is likely the driver was George Weidley who designed the car. It seems unusual that there was a limit on the max weight. If there are weight limits, they are usually minimum weights. At first, I thought it was Barney Oldfield’s car that had the engine replaced with a 13 liter Zeppelin motor. Thanks for setting me straight.